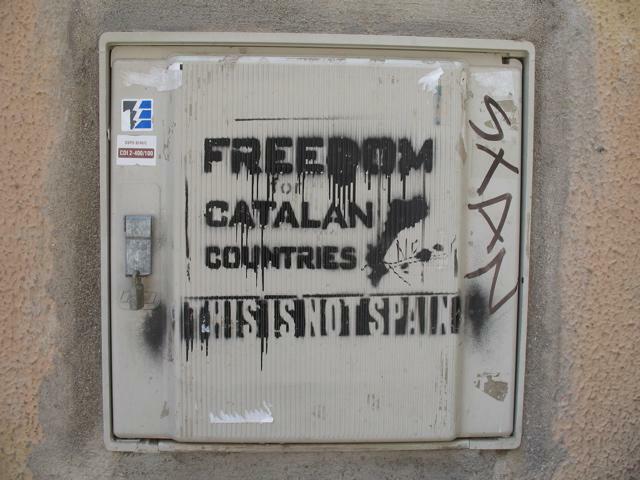 Catalan is that other language they speak here in Barcelona. It’s sometimes mistakenly called a dialect, though it’s officially recognized as an official language by the Spanish government (along with the Basque Country’s Euskara and Galician). If you’re not familiar with Catalan, it might sound like you’re hearing Spanish but not understanding anything. But it is its own unique language. I just started officially learning it and it’s a really bizarre experience. It’s something I’ve wanted to do pretty much since I got here but had so many changes in my schedule it was impossible to get a time pinned down. Now that’s sorted out, I went down to the Center for Linguistic Normalization and signed up for the cursos gratuitos (free classes) offered by the local government. The classes are pretty easy and low-key, especially compared to my college classes. I haven’t taken a class with ‘normal’ people in years! By ‘normal’, I mean people who aren’t necessarily super academically oriented or interested in classroom learning. It was almost like being back in high school in a way – I was trying to balance wanting to make friends with wanting to pay attention! There are no grades and no exams in the class (everyone grinned when la profe said that). People range from their early 20s to their 60s and come from mostly Europe and Colombia. Just about everyone has to learn Catalan for work, although I’m doing it for fun and to understand the culture better. Now, here’s the weird thing about my Catalan course. It’s a beginning language class, but everyone understands almost everything. This is seriously strange. I taught beginners’ English, and the students didn’t understand most what I said. In my first Spanish classes in Sevilla, I sometimes left class nearly in tears of frustration. 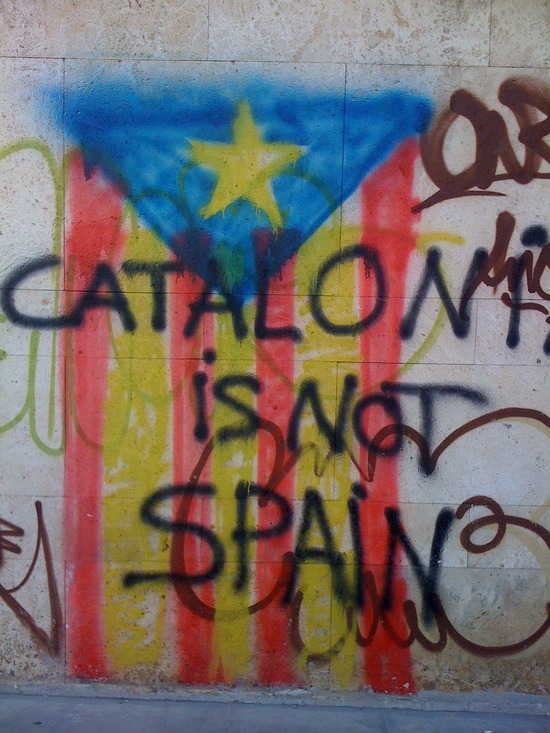 Structurally, Catalan isn’t that different from Spanish, especially at such a low level. Lots of the words are even the same, so as I speak good Spanish I understand about 90% of Catalan. But I can only say a few simple sentences. My brain gets completely confident and thinks “I understand Catalan without even studying it – I am obviously a language GENIUS!” My brain also thinks this when it reads Portuguese, and in both cases is quickly corrected. Lots of people think I’m wasting my time learning Catalan because I don’t need it at work, my friends all speak Spanish, and it’s useless. I disagree. Not that’s it’s useless, because on a worldwide scale it is pretty useless (even strong supporters of Catalan independence will admit to this). 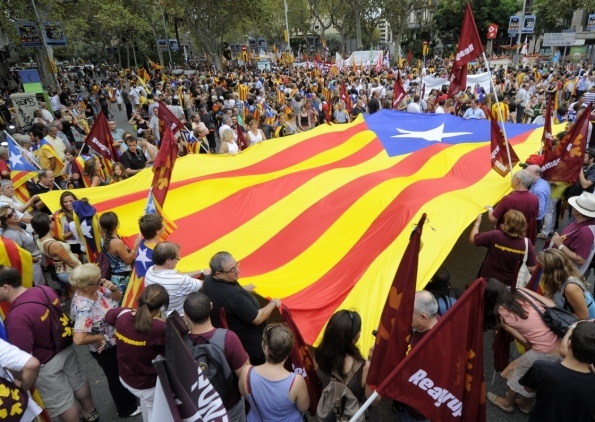 But the instant you express interest in the language to a Catalan, their faces light up. “Oh, you’re learning MY language!” a girl once told me delightedly. My local friends were so pleased I’d started Catalan that they immediately taught me some vulgar expressions to take to class. 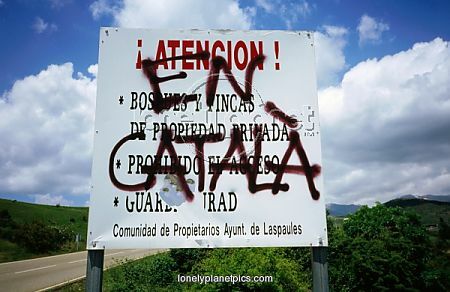 They say the Catalans are more ‘closed’ than the rest of the Spanish, and part of that definitely stems from the language difference even though they all speak Spanish (except for a few people in really tiny villages). But it’s not a language so much as a mark of respect, especially as they pride themselves on being different from the Spanish. Here’s the other, positive part of the Catalan stereotype: once you’ve made friends with a Catalan, they’re your friend for life. From what I’ve seen so far, this one is true too. And if I can do something as simple as learning a bit of a language to make lifelong friends, then why wouldn’t I? Not so different, right? Oh, and before I pretend I’m a really serious language student, I must admit I skipped class yesterday in hopes of going to a festa més tard. Uuups! Good for you! Learning is not useless — in any form. It keeps your mind sharp! I want to do language classes next year, maybe German or Portuguese. 100% agree. Plus, it’s not like you can run out of brain space! Portuguese is definitely on my list too. What a great post! My attempts to pick up some Catalan while I was there ended in failure, but I’m fascinated by the language. Good on you for learning it! Thanks! We’ll see how it goes, but it’ll be great to know at least una mica! That’s awesome that you’re taking language classes- though I’d imagine that it might be harder to keep them separate in your mind when they are so similar. Then again, I confused English and Japanese the other day, so it’s likely just me and my own lack of brain function. It is definitely confusing! Sometimes I accidentally learn Catalan words instead of Spanish ones, which I didn’t realize until I traveled to the south of Spain and nobody understood. English and Japanese sound a little more different. 🙂 But language learning doesn’t make any sense sometimes. So true, it’s a mark of respect and an ice breaker with any Catalan person. Good on you for learning it…I’m still limping along with my Spanish. Oh the shame! It’s definitely a good ice-breaker. But it makes much more sense to learn Spanish first – good luck with yours! I think learning the local language is such a smart thing to do… It helps you know more about the place you are living and it’s traditions and culture. But I understand that when someone that don’t know Spanish comes here, they prefer to learn Spanish first. And it’s so logical, Spanish is a language spoken for millions and millions of people around the world. Oh, and I think learning Catalan it might help you whenever you decide to learn Portuguese. They sound alike, and when my sister visited Portugal, they understood her better talking to them in Catalan than in Spanish! hahhahah! Aww, I’m glad it made you happy! When people have that reaction, it’s such a big motivation to learn. Oh and about the not speaking Spanish…a friend told me his grandmother who lives in a village in Lleida doesn’t speak much Spanish. I also met some people from Olot who said similar things about older family members who live in really small towns. They understood, but they had a hard time speaking it. Yeah, because it’s more than an interest in the language – it’s an interest in their culture, and it does come across. I’m afraid my Catalan is still pretty basic, as there weren’t any classes over the summer, but I’m starting again soon! Good for you learning Catalan, I’m interested to hear it is so like Spanish as I had thought it was at least half French. I didn’t know that Sicilians had their own language, so I’ll definitely check out your post right now. Thanks for sharing it! I’d say Catalan is pretty much like French rather than Spanish. De res! I think it looks like French, though I don’t speak any French. It’s not so different from Spanish either. Es un llenguatge maco eh, que be que et va agradar. Pero no es tant raro, es com les classes d’angles o de castella.